Warning: this post may make you want a pizza! Another trip is in the bag and a lot of pizza was eaten: 9 times in seven weeks! We used to eat pizza every week, as evidenced by the title of this blog. It has been two years since we followed the weekly habit but travel gives us the perfect excuse reason to continue our research. Overall, we had a better pizza experience this year than in 2017 when we only found one truly great pizza (see Pizzeria Back to Basics) and several marginal ones. Bar al Teatro’s peaceful and lovely dining room. It is a small place, so a reservation is advised. We went to Liguria for seafood — and we had some excellent meals with grilled fish, clams, mussels, and marinated anchovies — but we also found the most outstanding pizza of the trip at Caffe al Teatro in Camogli. Caffe al Teatro is attached to a very grand theatre venue with appropriate elegance for such a fine building. Not your average Italian pizzeria. It has white tablecloths, crystal, soft lighting, a mellow playlist, and a server who would be at home in a Michelin-rated restaurant. But they crank out pizza. There are antipasti, one or two kinds of pasta, and desserts, but primarily it is pizza on the minds of the dinners. At Caffe al Teatro the pizza choices are extraordinary and creative. There are the usual suspects, like Ric’s Pizza Romana with anchovies, olives and capers, or a simple Salami Piccanti. There are also more exotic and unusual creations. The Pizza alla Stefano was so good I had it on both visits: mozzarella di bufala, raddicchio, grana padrano, spinach, and prosciutto turned out to be a wondrous combination. Grazie, Stefano! The wine list is fairly robust for a small establishment, but we found the house wine to be a great pizza wash. Never made it to dessert. Caffe al Teatro gets a solid 10 in the Our Weekly Pizza ratings. Quality product, great service, and a charming dining room merit 9 points, and an extra credit point for pizza choices. You can even pick your dough! Absolutely go there if you are in the region. Open evenings only, in true Italian tradition. My charming pizza testing companion at Caffe al Teatro. We “discovered” La Tambra of Santa Cristina in 2016 when we spent the month of July in Ortisei. I am pleased to say it was worth the trip, still producing a great product. It is an awkward trip by bus: easy to arrive for dinner at 19:00 or so, but regular bus service stops and one has to wait for the hourly “Night Bus” to return to Ortisei. La Tambra still garners 9 points from us. Consistency and excellence. The rest of the menu looks good, too, but I’d have a hard time going there and eating anything other than pizza. Maurizkeller in Ortisei is an old standby. We go there every trip and have probably eaten half-a-dozen pizzas over the past few years. This trip, we went twice! Not much I can say that I have not said before. (See the link above about La Tambra.) It’s a reliable choice in Ortisei. Maurizkeller still gets a solid 8 points. And they have the largest selection of pizzas we have ever seen. Located in a subterranean space, but light and lively with room for eveyrone. Owner Alex (standing) is always present and seems to have time to visit with every guest. They are open about 9 months of the year so I hope he gets a good rest in the off-season. Maurizkeller’s wood-fired oven turns out a great product. The balance of our pizza-eating this trip was in Switzerland and we were delighted by the quality. First up, Nostra Pizzeria in Pontresina. This was our first visit to Pontresina. 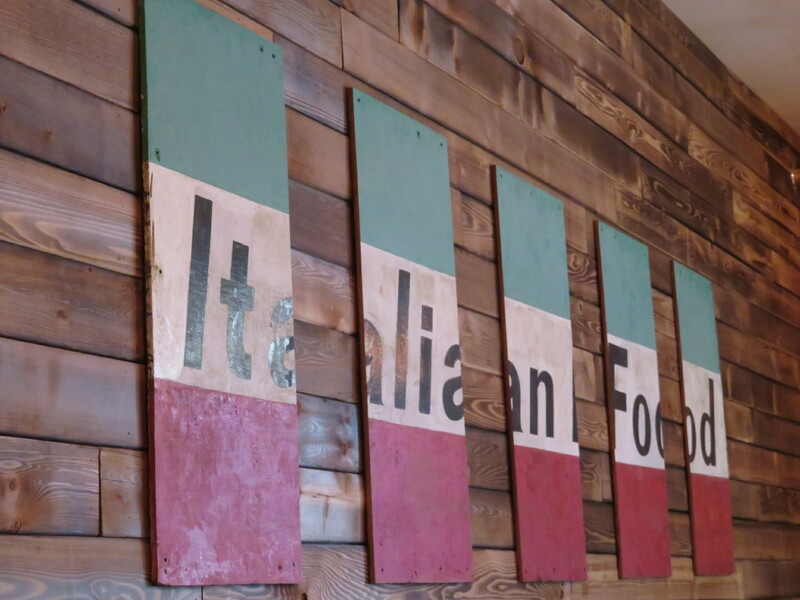 Finding that most residents were Italian-speaking was a plus and a truly Italian pizzeria was a bonus. The service was in a mixture of German and Italian with a smattering of English. Beer dominated the drinks menu and the service was Swiss-efficient almost to the point of brusque, but they turned out a good pizza. The place was very busy even though Pontresina was headed toward end-of-season. Nostra Pizzeria is an 8-pointer. Excellent product, good service, nice dining rooms. Ric’s pizza with anchovies and olives. Note the blackened crust, a sign of a wood oven. My pizza with salami, mixed peppers, and onions. Not exactly traditional but delicious. We love Lauterbrunnen almost as much as we love Ortisei. The transportation! The mountains! The beautiful hiking! The expense! A pizza in Lauterbrunnen — a pizza for ONE PERSON — will set you back $18-$22. (The same pie in Italy would be $8-12.) Interestingly, pizza is still one of the least expensive things you can eat in a restaurant there. A plate of Rösti (essentially fancy hashbrowns) will run $22-24! I’d rather eat pizza and we ate it twice during our Lauterbrunnen week. Nota Bene: We cook a lot when we go to Switzerland. Future blog over at http://www.Girovaga.com about cooking on-the-road. Restaurant Wiedstuebli @ Camping Jungfrau: Salami, peppers, and onion, what else? Pizzas in German-speaking countries seem to feature onions more than in Italy. The best was at Weidstuebli at Camping Jungfrau. In the middle of a camping park (think mini trailers and cabins, not giant RVs), this little place is always buzzing. We failed to make a reservation but they accommodated us at what seemed to be the last unreserved spot. Is this the best pizza we’ve eaten? No. But the service is lovely, the restaurant Swiss-cute, and the pizza is huge, more than I could eat. Ric helped me. The Weidstuebli gets 8 points. We also like to stop by Hotel/Restaurant Steinbock in Lauterbrunnen. We stayed here on our first trip to the area at New Year’s 2014. It’s a rather down-market hotel but we were very late planning a trip in the high season so we could choose the Hotel Steinbock or pay $400 per night. We went down market. It was fine: clean, private bath (only two rooms in the hotel have ensuite facilities), good breakfast, and a bonus for Ric: a view of the train station and trains. But I digress. We eat here partly out of nostalgia. The pizza is fine, not great, the service is indifferent, the dining room typically Swiss, dark wood. Interestingly, a lot of locals eat here and are warmly greeted. 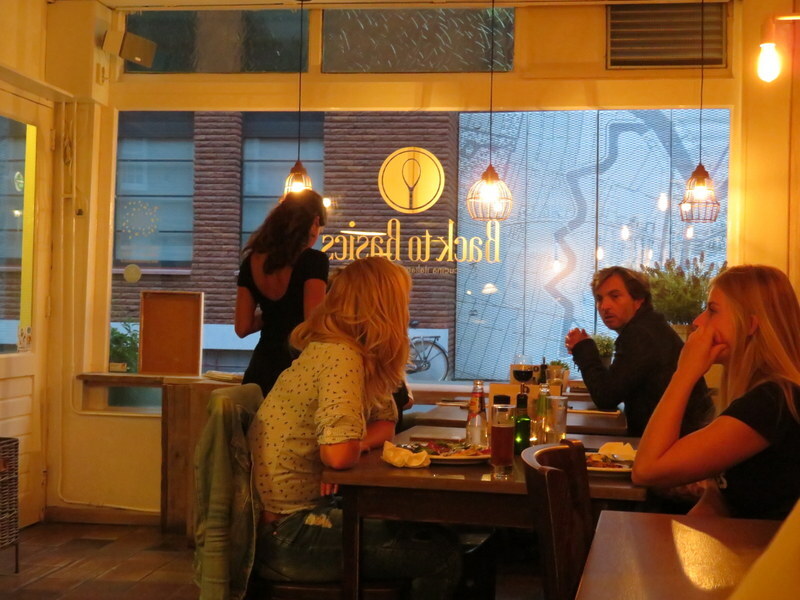 I have to give Restaurant Pizzeria Steinbock 6 points as it really is nothing special. Prices, for the area, are not bad. And we had decent beer. Moving to the French-speaking part of Switzerland, we found another fine-dining approach to pizza: white tablecloths, attached to the opera house. This is Restaurant du Theatre. The menu is quite high-end (foie gras or partridge anyone?) and goes well beyond pizza, but you know why we were there. Despite our proletarian tastes, the host and servers treated us with quiet deference. They should: pizzas averaged $24 per person! Wine-by-the-glass was also expensive at $7.50 per deciliter (about 3.4 ounces). We can down a deciliter in no time. Gulp. The restaurant is huge with function rooms and a lovely terrace. Was it good? Yes, indeed it was! 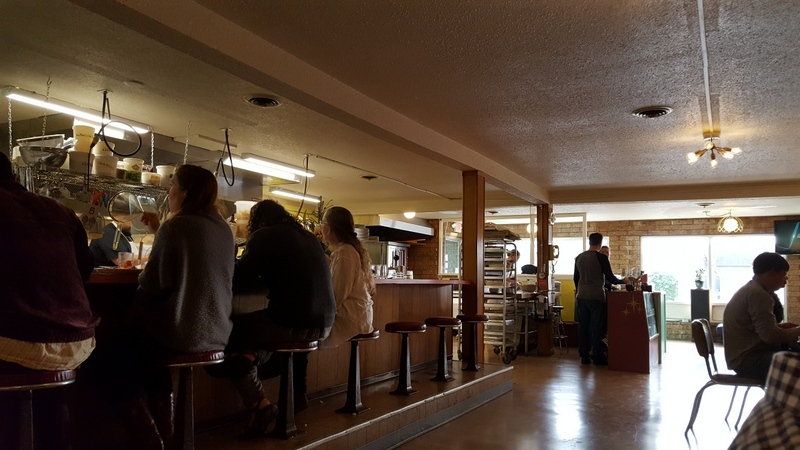 The pizzaiola was right there in the dining room with his wood-fired oven churning out pies for an appreciative audience. Maybe not the best crust and the sauce was a little bland, but overall a fine product in a lovely space. Although the restaurant has a high-end feel and menu, if they did not serve pizza there would have been very few diners. From a single diner reading a book over his pizza to a lively family of five with a few two-tops as well, pizza dominated the food orders. I shudder to think what the bill was for the family of five! My pizza, with eggplant and basil. Delicious! Ric’s choice, salami piccanti with capers and olives. 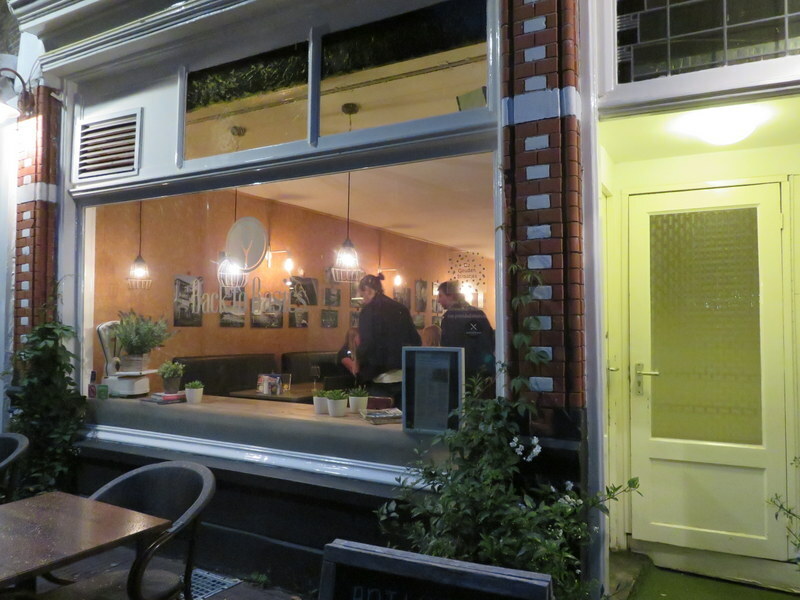 Restaurant du Theatre gets 8 points: service a 3, ambiance a 3, and for the pizza, 2. 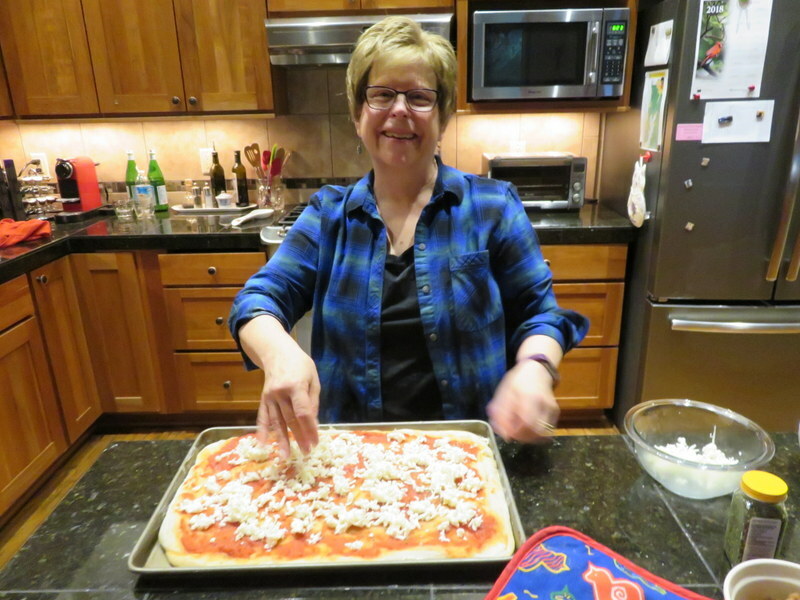 For now, pizza eating will take a backseat to healthier eating at Casa Barton. Seven weeks of travel takes a toll. If you’d like to read more about our 2018 trip to Italy and Switzerland, hop on over to Girovaga.com and the Project Easy Hiker blog. Bowling, pizza, beer, and great cookies. How can you go wrong? This unique new offering from the folks of Hearth & Table Kitchen opened in mid-May after a two-plus month closure. We used the occasion of a visit from our son to try it out. Ric is not a fan of bowling, and although Derek and I had not bowled since the turn of the century, we thought to give it a go. We had a great time and terrible results: about what we each expected. The beer was stellar as OldeLine Lanes & KItchen features a fine selection of craft beers on a rotating basis. Bowl a few lines then revive yourself with beer and excellent pizza. 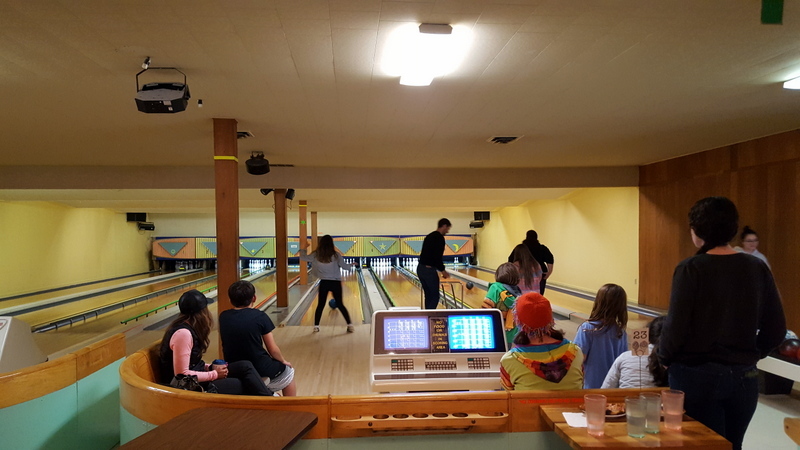 The lanes are fine for family bowling but perhaps not up-to-par for league bowlers and an acceptable ball was difficult to locate; However, they are set up with gutter bumpers and ball guides so youngsters have a chance of actually knocking down a few pins. The pizza is now only available in one size: enough for two but insufficient for three. Unfortunately, we did not realize the size problem until the pizza was delivered to our table. So we ate a rather light meal and followed it up with their excellent house-made cookies to-go. 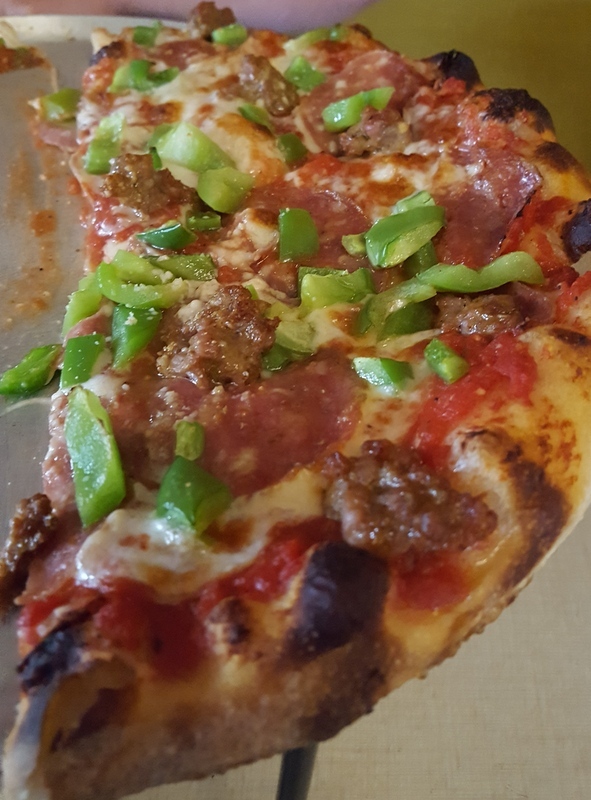 We built a pizza from the choose-your-own ingredients: sausage, salami, and green pepper. The offerings on the pizza menu are a bit gourmand for our tastes. Kale, feta, grapes, apples, and salt cod have no business on pizza. Luckily you can make your own, selecting from a small group of more traditional ingredients. The pizza is still great, the atmosphere unique, the bowling a fun option, but the restaurant menu does nothing for me. I would gladly stop by for a cookie, though. Pizza Quality: 3 This is expensive pizza, but you get what you pay for. Fresh mozzarella, high-end meats, beautiful produce, and an excellent handmade crust. Service: 2 Semi self-serve in that you order at the counter and they serve the table. They even tied our bowling games and refreshments to the dinner tab so we only paid once. But the servers were spread thin. Perhaps this is just shakedown as they had only been open about 10 days. Counter seating. The 50s lino kitchen tables and lino flooring. Might remind you of your grandma’s kitchen. Ambiance: 2 The subdued environment of the old location has been replaced by the sounds of bowling. The lanes are separated from the dining space by a wall and corridor, so the sound is dampened but it carries. The dining space is linoleum with no baffling and the kitchen is open. It is lively when there are a lot of diners, which was the case this Saturday night. I do like the retro furnishings and accessories (think 1955-1965), but it does not invite lingering. This was originally the D-Lake Bowl. Former owners left behind some posters of the era. Cute graphics from another era. Now-and-then we need a quick, fuss-free meal in front of the TV. This product is perfect for eating on the couch while watching a movie. Papa Murphy’s is rather sterile, but it’s fun to watch them make your pizza. For those unaware, Papa Murphy’s makes pizza you take home to bake. In 12-15 minutes you have a hot, fresh pizza for home consumption. They do not have ovens on-site nor a place to dine; Just unbaked pizzas to go, as well as salads, cookie dough, and soda. You walk in the door and 5 minutes later you wl out with a pizza. It won’t win any awards compared to pizza in Italy, but we’ve had worse. It’s better than frozen pizza and far better than Gallucci’s but not nearly as good as Hearth and Table or the Cafe on Hawk Creek. It is even better than the pizza at Cascade in the Val Gardena. Our pizza master adds sauce to a pre-made crust. 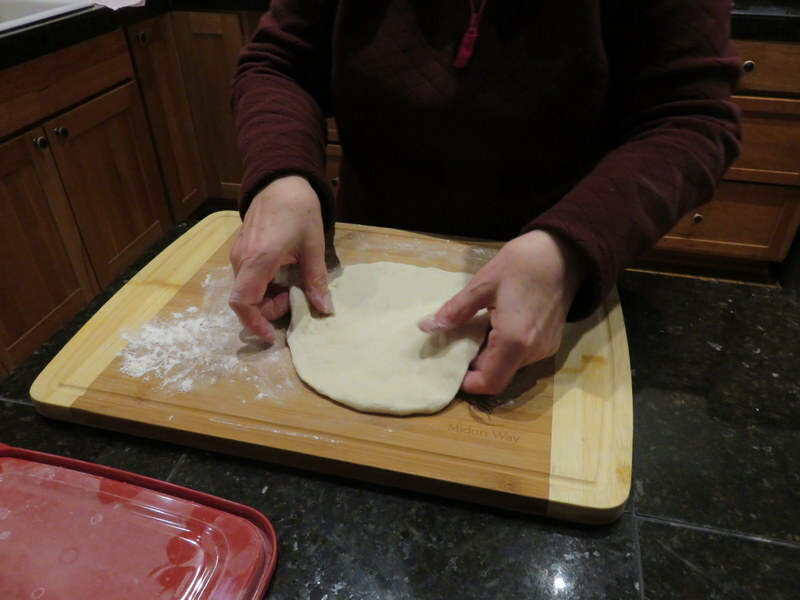 We like the thin crust as it comes out nice and crispy. My Italian friends would probably be shocked at this product. But then, I have seen good Italian pizzas as takeaway and I cannot imagine the result is palatable. Pizza gets cold and soggy very fast in Italy. Maybe they reheat it? At least Papa M’s is hot. A raft of decent mozzarella is added. Not fresh mozzarella, but it bakes up nice and gooey. This is not a frequent occurrence for us. Since Hearth and Table just reopened (so we want to give them some time to shake off the newness) and who knows when The Cafe on Hawk Creek will reopen, this is our best alternative to making pizza a casa. Fresh veggies and sausage complete our selection. At Papa Murphy’s one can get almost anything on a pizza, including many ingredients one would not find in Italy. I have to say. BBQ chicken pizza does not seem like a good idea but to each his own. I am assigning it 8 points. 2 for taste/quality (all fresh ingredients), 3 for ambiance (at home), and 3 for service as the young people at Papa M’s are always so pleasant. A large pizza was $16.50. Hard to beat, but all-in-all, I’d rather be sitting at Da Remo. The finished product, just out of the oven! I moved the olives over to Ric’s half. Since of late great pizza near us is harder to come by than an honest politician, we have been experimenting with pizza at home. 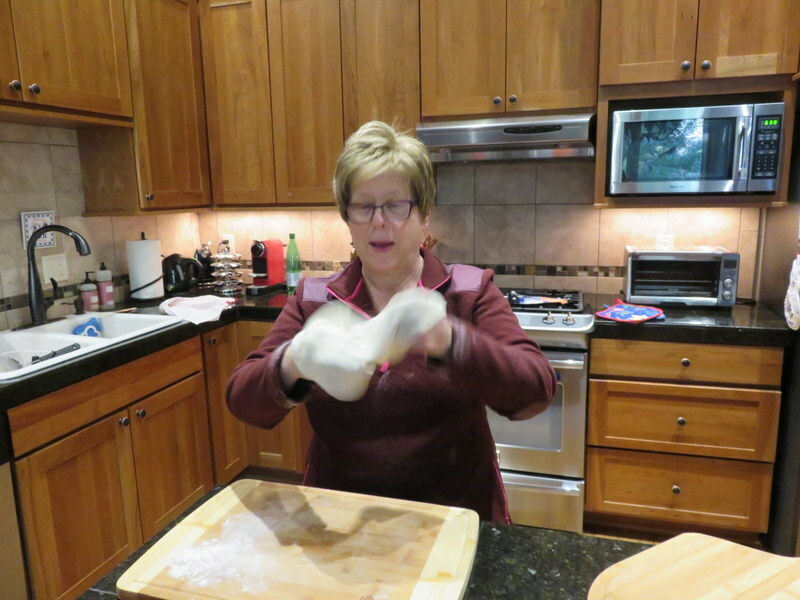 For our first trial, in January, we had a new pizza stone and armed with the NY Times dough recipe, we invited our neighbors over and prepared the dough two days in advance. With the pressure of onlookers, I had trouble working with the dough so the pies were shaped like the state of Maine (or maybe Germany). Not pretty. 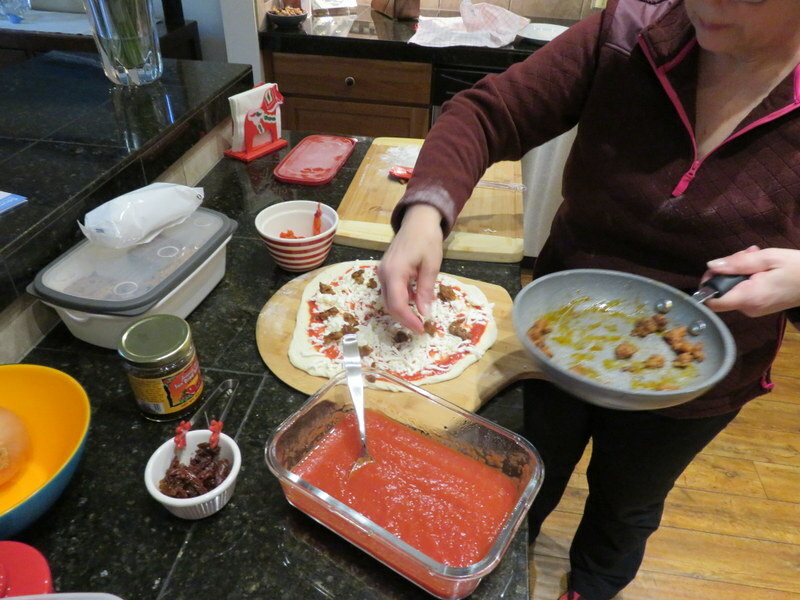 We ate them with gusto and declared the crust worthy and the traditional pizza ingredient choices excellent. After-the-fact, I discovered my 48-hour-refrigerator-rise dough was supposed to be “proofed” for a couple of hours at room temp to make the dough workable. Duh! 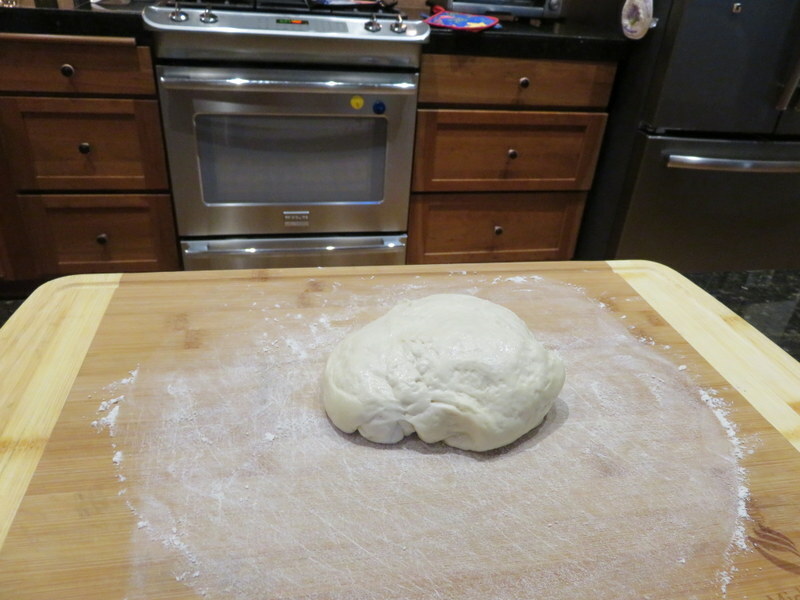 Proofed dough – relaxed and ready for pounding and stretching. Moving on, we tried again. Ric wanted pizza for his birthday in March, so I made the dough two days in advance and dutifully took it out to proof about 2 hours early. It was far easier to work with. I found a delightful video on YouTube about proofing, pounding, and stretching and I followed the steps easily enough. Not quite round, but not an irregular mess either. 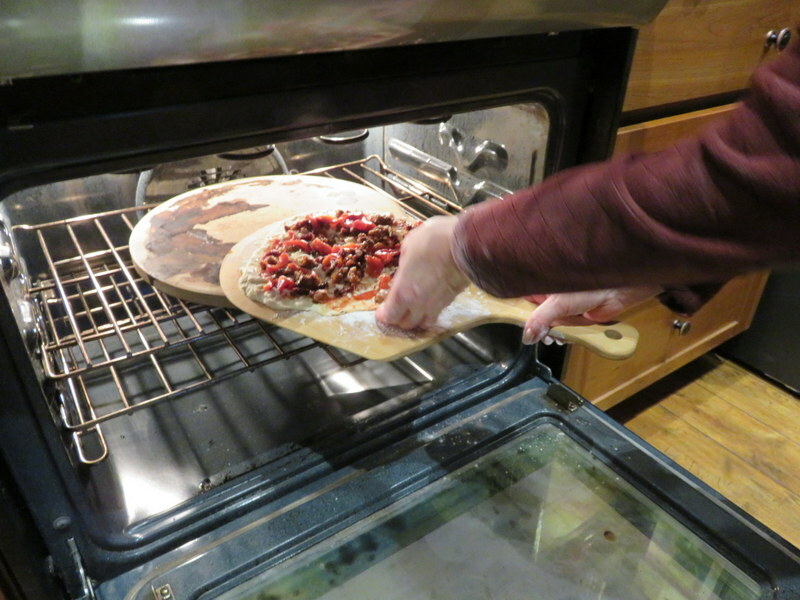 I slid the dough onto the pizza peel, which was dusted with flour as the video recommended. Ugh! The flour did not work! The pizza stuck miserably to the peel. (In January, I had used cornmeal with good success in the sliding-off-the-peel department.) 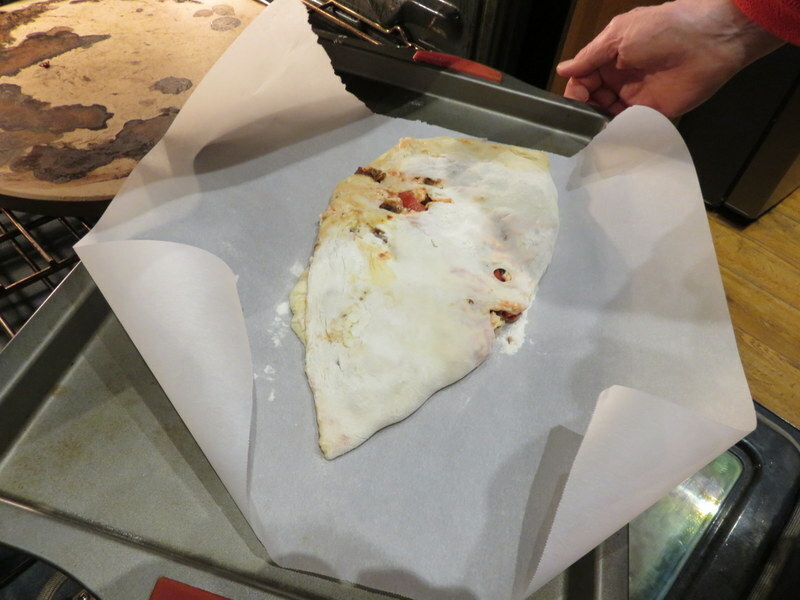 We ended up folding the pizza calzone-style and dumped it unceremoniously onto parchment to bake. This was a sausage/roasted red pepper/sundried tomato combo with tomato sauce and fresh mozzarella. Tasty, but ugly and too much flour on the crust due to the mishandling. Shaping the pizza. So far, so good. Stretching is the hard part. No need for flipping it in the air. Do it carefully on the knuckles. Now on the pizza peel, we add the toppings: tomato sauce, sausage, caramelized onions, sun-dried tomatoes, and mozzarella. Here’s where I got into trouble. The pizza would not slide off the peel onto the nice 450-degree stone. 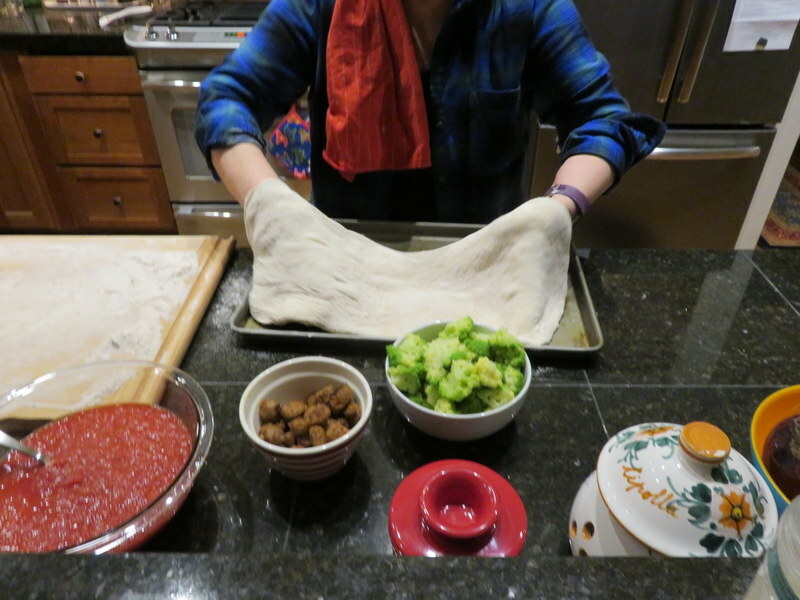 We resorted to folding it ala calzone-style and flopping it onto parchment, then onto a baking sheet. We did eat it, troopers that we are. 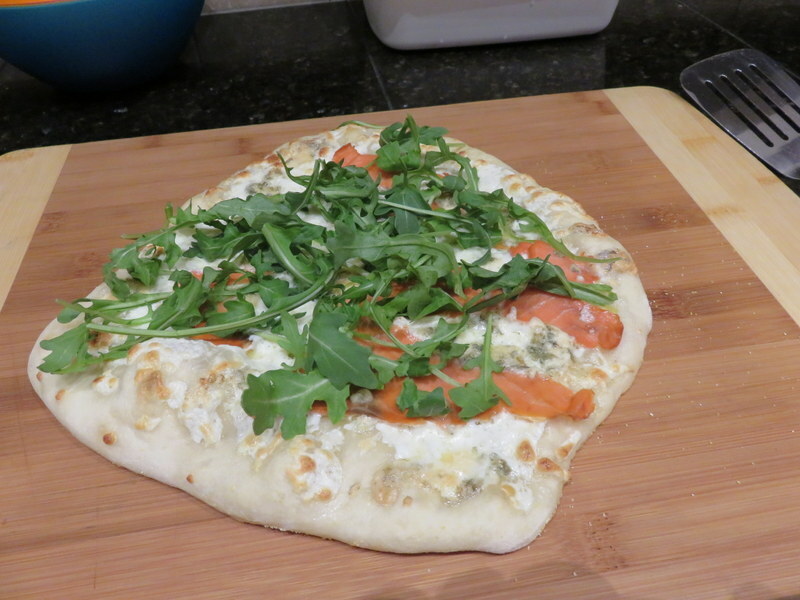 Pizza #2 came out better: smoked salmon, gorgonzola, and rocket with mozzarella, no tomato. I used cornmeal on the pizza peel which allowed it to slide nicely, although I still need to work on getting the dough even. The center was thin, the edges a bit too Neapolitan (thick) for me, and far from round. The crust did not brown well, as we only cranked the oven to 4500 Fahrenheit to avoid smoke detectors blaring. 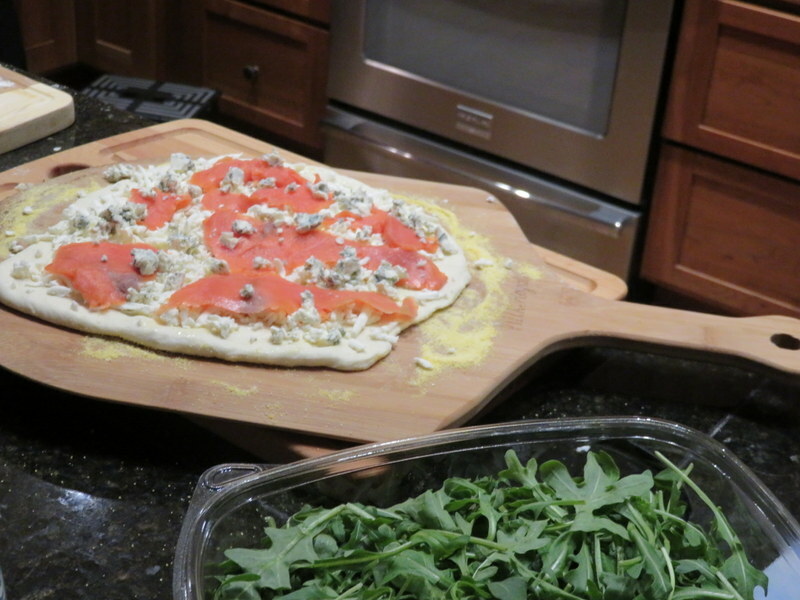 Pizza number two with smoked salmon and gorgonzola. The peel is treated with cornmeal and slid easily onto the stone. Finished product. Not exactly round, and a bit pale. The oven needs to be hotter, but my it was tasty! Committed to trying again, I followed the advice of my Norwegian blogger friend Krumkaker and made pizza a taglio. As promised by Krumkaker, the dough was easy to work with. I did watch Gabriel Bonci’s video over-and-over to get my technique down and it paid off. I did not overwork the dough and there were air bubbles in my crust as desired. This is a bready type of pizza, with a base similar to the pizze one gets in a bakery in Rome: a focaccia-like base that is often simply spread with crushed tomatoes. Or as true pizza a taglio, it can be topped with any toppings one desires. 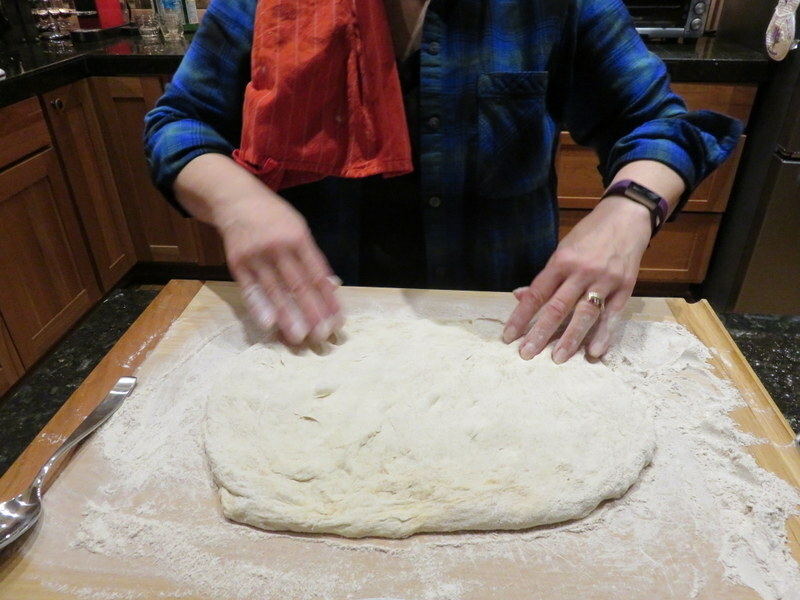 The Bonci-style dough I learned from Krumkaker is much softer, or morbido, and easy to work with. Fits perfectly in my well-oiled baking sheet. 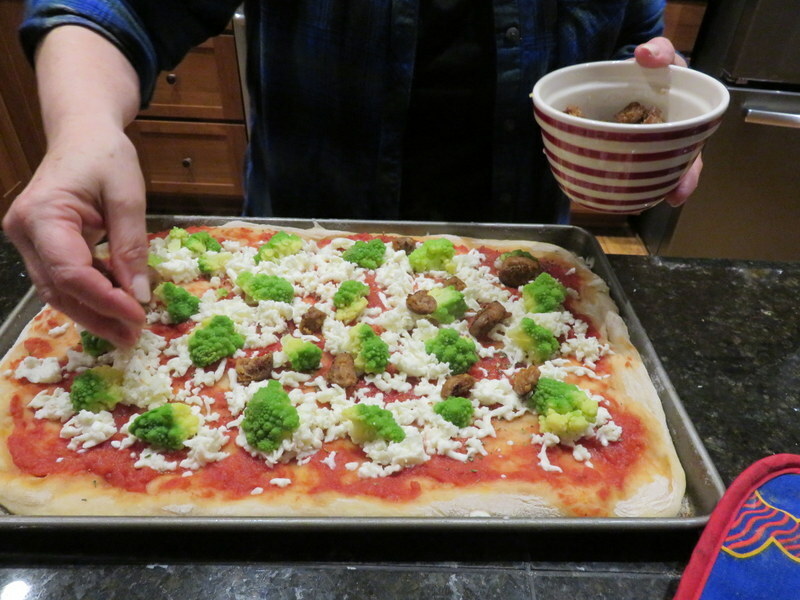 For our toppings, we had broccolo languishing in the freezer and used some spicy, American-style Italian sausage, fresh mozzarella, and a sprinkle of Pecorino Romano, along with Pomi brand Italian crushed tomatoes and a bit of oregano. We learned a long time ago you do not need to cook a sauce. Simple is best. Adding cheese. I had already baked the crust with the tomato sauce on it for 5 minutes. See how happy I am with the outcome so far? And now the tasty bits: broccolo, aka Romanesco, spicy sausage, a little grated pecorino. A little side-story on the broccolo. Our favorite pasta is orecchiette con salsiccia e broccolo. Orecchiette are the little-ear pasta and you would know broccolo as Romanesco. The salsiccia is, of course, Italian sausage, and there are also a few anchovies, some white wine, and fennel. Simply delish! We have only seen Romanesco once since we’ve lived on the Oregon coast and that was a tired-looking head at Fred Meyer in Newport. We asked at our local small-town store, Kenny’s Beachside, and the produce manager said he’d see if he could get it and let me know. He brought in a dozen (I suppose a case full) and I felt obligated to buy two though I only needed one. At $7.99 a head (triple what I would pay in Rome!) I was not about to waste any, so I used one for the pasta then separate the florets on the second head, parboiled, and froze them. Voila! We had some available for the pizza. We dared to crank the oven up to 4800 Fahrenheit and baked the crust with only the tomato on it for five minutes, then another 12-15 minutes once we’d added the toppings. The base of the crust was firm and slightly chewy. 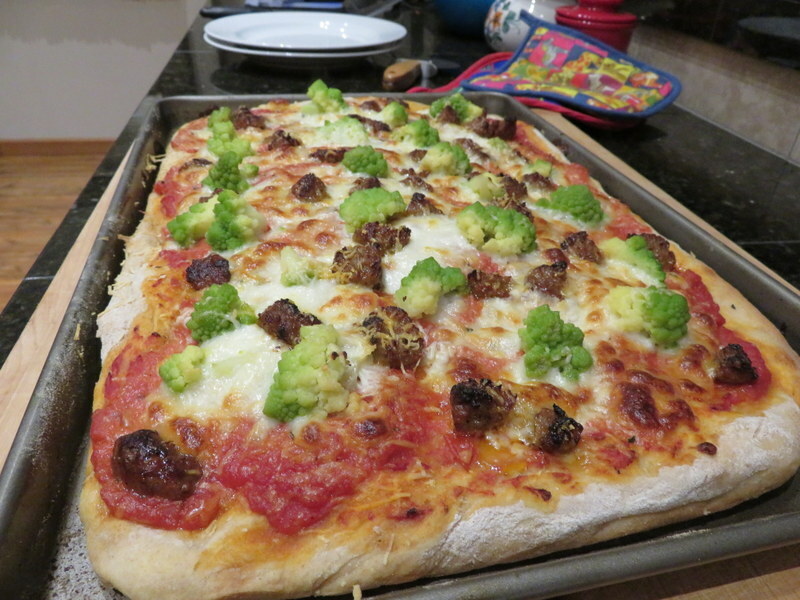 I was not thrilled with the broccolo texture as it got mushy from freezing and baking. It would probably have been better baked raw on the pizza for 15 minutes at that temperature. All-in-all, a satisfying pizza evening with enough leftover for breakfast. Next time we will try sausage with caramelized onions and sun-dried tomatoes along with fresh mozzarella and the tomato base. I also want to try the thin-crust variety I struggled with in my first efforts now that I understand proofing and the importance of cornmeal. And that I can get the oven a bit hotter without setting off alarms. Neither type will replace our local favorites at Hearth & Table or The Café on Hawk Creek, but it will be fun to master the skills. Pizza making does make rather a mess of the kitchen. Organizing one’s mise en place is essential, as is a trusty clean-up partner. Sadly, the variety of pizza available to us these days does not support our weekly habit. 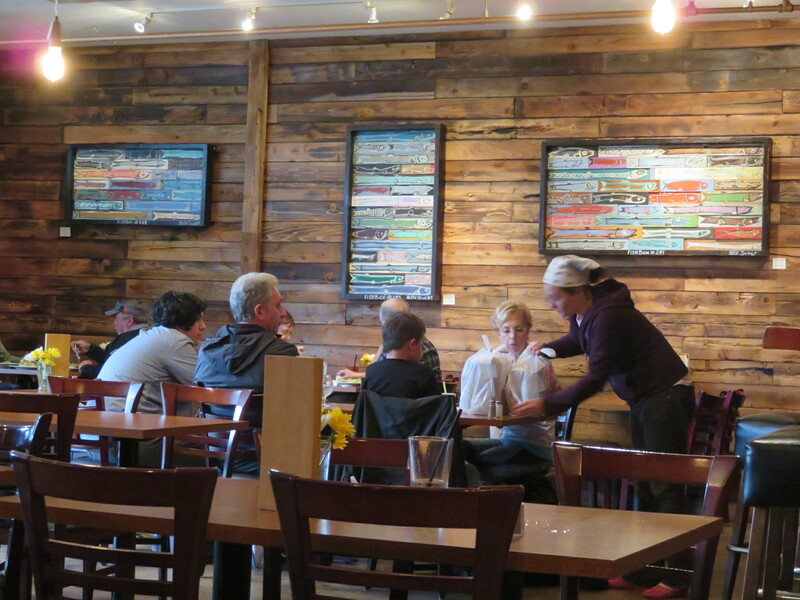 We have continued to enjoy Hearth and Table as well as The Café on Hawk Creek. However, much to our chagrin, they are both closed temporarily. The pizza oven at Rusty Truck. No wood, but hot! Hearth and Table has promised to keep its menu as it relocates to the old Lincoln City bowling alley where it will re-emerge as Olde Line Lanes & Kitchen. Yes, there will be bowling. We love the pizza but are worried about the noise level. Reopening in May, possibly. We will review the new incarnation as soon as it reopens. Such nice people there, too. The Café on Hawk Creek is tied with Hearth and Table for our pizza affections. Sometime shortly after our last visit in January, they embarked on a major remodeling and expansion. They had to put in a new foundation and are greatly expanding the seating capacity. Luckily, the wood-fired oven is part of the new plan. No idea when they will reopen. “Spring,” they say, so it could be June. My favorite view at dinner. Rusty Truck brews their own craft beers. Cin cin! We’ve tried making pizza at home and a blog on that will be along soon, but in the meantime, we returned to Rusty Truck Brewing. We had pizza there last August, right before we went to Europe, and I wanted to have a second visit before we passed judgment. The Rusty Truck is first and foremost a brewery with a baker’s dozen of beers on tap. There is a full pub-type menu with entrees and sandwiches, but the key to our interest is pizza made in a decent, if not wood-fired, pizza oven. My pizza, the Road Hog: pepperoni, sausage, veggies. Nicely done. We had the good fortune to sit right above the pizza station where we were delighted to watch the pizzaiola at his craft. He knew how to handle the dough and deftly managed an enormous pizza peel as he shuffled the pies in-and-out of the oven. 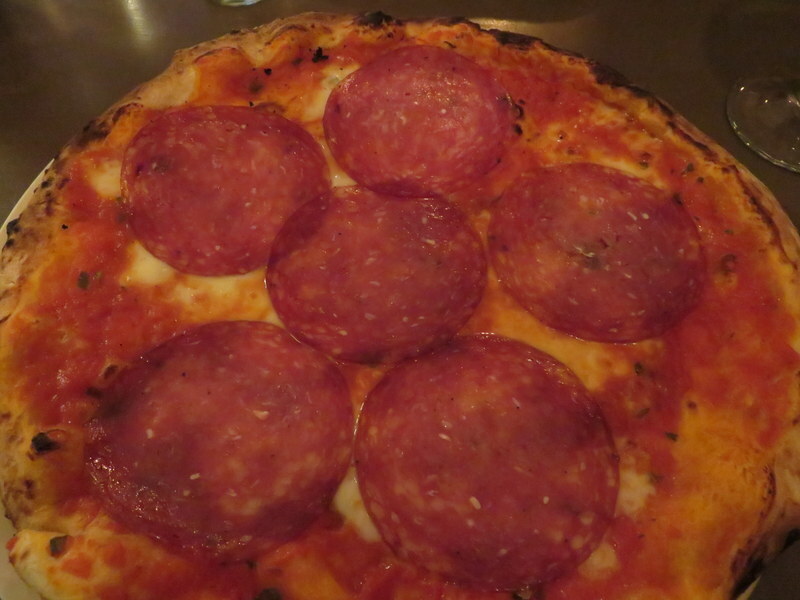 The pizzas are small, with a crust that is thick by Italian standards, but tasty and chewy. Ingredients are top notch, although some of the varieties are odd by Italian standards. The “Meat Lovers” pizza includes grilled chicken, for example, and there are two more of the eight offerings that include chicken in a starring role. Not my kind of thing. Ric’s choice, the Meat Lovers pizza with five types of meat. I will say the fresh ingredients are top quality, the mozzarella is gooey and stretchy, the sauce flavorful. And even though a pie is only 8-inches (smaller than the average Roman pizza) I could not eat my entire pizza. Luckily leftover pizza is welcomed on my breakfast plate. The beers are very good, too. While one can find their beer in more than 80 locations in Oregon, it is nice to have a pint at the source. We tried a non-pizza dinner at the Rusty Truck one evening in February. We went on a Wednesday and found a very quiet scene with seating only in the bar. In winter they serve pizza only on Friday and Saturday when the tourists hit town, so we settled for Steamer Clams (me) and Cavatappi-Crusted Mac & Cheese for Ric. My clams tasted off so I rejected them after eating very few and shared Ric’s M&C, which I would classify as merely OK. The server did knock 50% off my clams (should have been 100% IMO), but I would not order them again. I can do better at home. We will try to discipline ourselves to go have lunch and try something other than pizza. After all, in Italy, pizza is only for dinner! Nice outdoor deck for summer dining. Pizza Quality: 2 Quality ingredients, an especially good crust and some creative toppings using chicken, if you like that sort of thing. J Can’t give it a 3 because Hearth & Table and The Café on Hawk Creek are far superior. And then there’s chicken which just does not belong on pizza. Service: 3 Caring, friendly, but not annoyingly so. Pizzas come out fast. Ambiance: 3 I’m giving Rusty Truck a 3 because it is a cute space, on the large size but with good separation of dining areas and nice outdoor space as well. It can be noisy when children are present. Best to dine after 19:00 to avoid the rug rats. Or sit in the bar. The Rusty Truck is a large presence on Highway 101 in the Taft area. Indoor and outdoor seating, weather permitting. The brewery is onsite, too. Returnability: Go-to Place – fine if you are in the area. Ahhhh, Italian pizza at last! What? In The Netherlands? You betcha! Francesco moved from Napoli to Haarlem 30 years ago. Today he dishes out the most Italian pizza we’ve had since we left Roma. Cute little cafe on a quiet pedestrian street in Haarlem. The owner (and his cat) live upstairs. I have to thank Rick Steves for the suggestion as Back to Basics made the cut for his guidebook. We sauntered in on a cool but dry Friday night, finding a cozy cafe reminiscent of so many in Italy. Francesco was making pizza in his wood-fired oven right there, greeting patrons, chatting with the locals. He was amazed to hear me speak Italian and I enjoyed getting the chance to try out a few sentences. It has been a long time since I had the opportunity to chat in Italian. 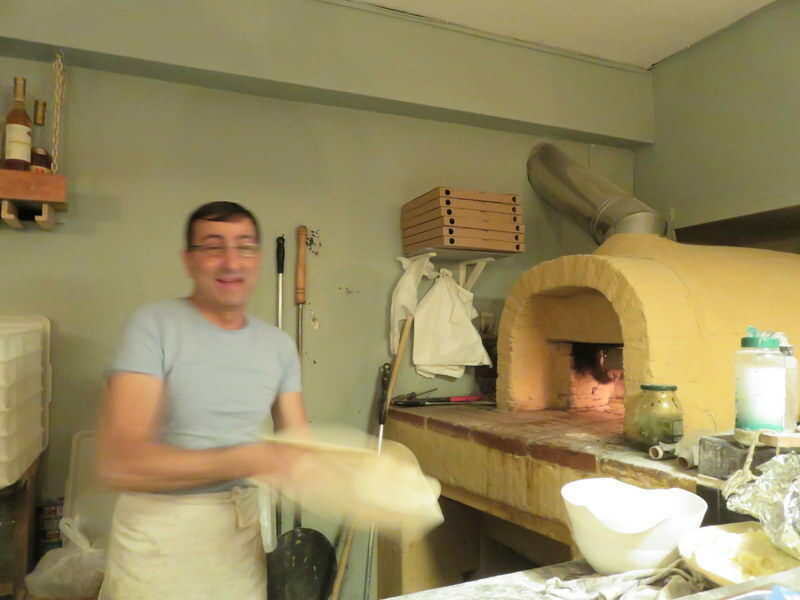 Francesco works the dough in a blur. He turns out amazing pies from his tiny oven. The pizza is Neopolitan style, with a thicker border and softer crust. It was delicious! With fresh Italian mozzarella and the finest Italian meats, it tasted, well, like Italy! Even the wine list was all Italian and we were able to pair our pizza with a favorite negroamaro. To add insult to injury, Francesco also offers housemade gelato, so naturally, we had to indulge. Like a couple of five-year-olds, we stuffed ourselves with pizza and ice cream. Imagine this was all in The Netherlands! We cannot wait for Italy!!! A few table outdoors and a perfectly lovely cafe, great service in three languages, cute little wood-fired oven = 9 points on the OWP scale. The only thing better might have been if they had arancini. My choice: Salami and mozzarella. Simple and authentic! Ric’s pie, another Italian favorite, salsiccia (sausage) and broccoletti. Francesco’s daughter waits tables. Other than a German couple who left as we arrived, the crowd was local. We are still eating pizza in the U.S. but not quite weekly as there just are not enough choices near us. And the pizzas are all huge and heavy. Coming soon, though, another Lincoln City pizzeria to write up: The Rusty Truck. We will also have more from the road during our Grand Tour, which I am writing about over at Good Day Rome. Sorella, in the historic Nye Beach area of Newport, OR. Sometimes the first pizza we have at a new-to-us restaurant does not thrill. 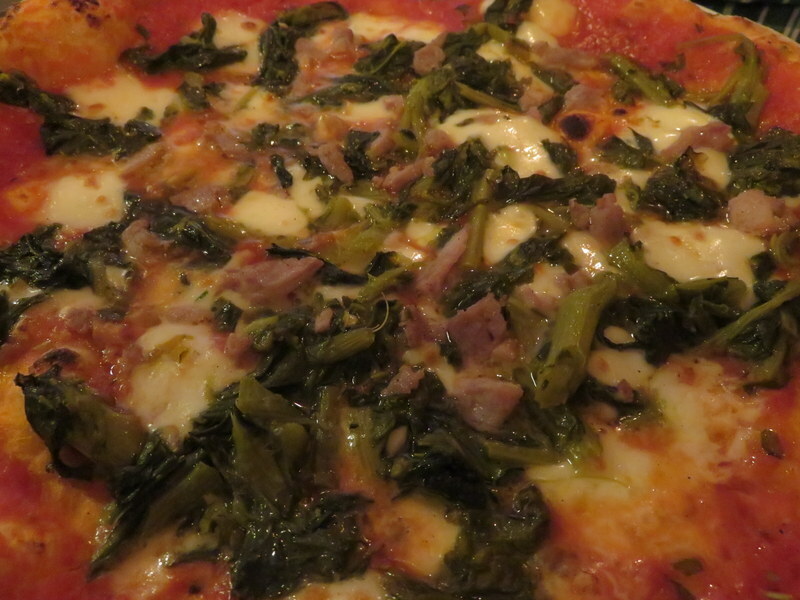 We visited Sorella with high hopes a couple of months ago but found the pizza, while tasty, to be overly salty. 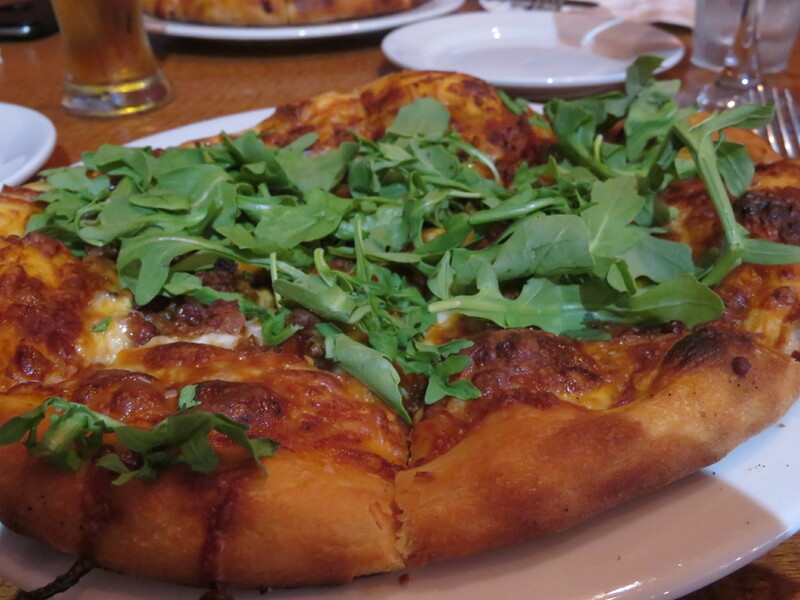 I was ready to write it off as not-so-worthy; however, we were impressed by the overall menu and rather than judge on one pizza, we vowed to return before committing our impressions to the blog. 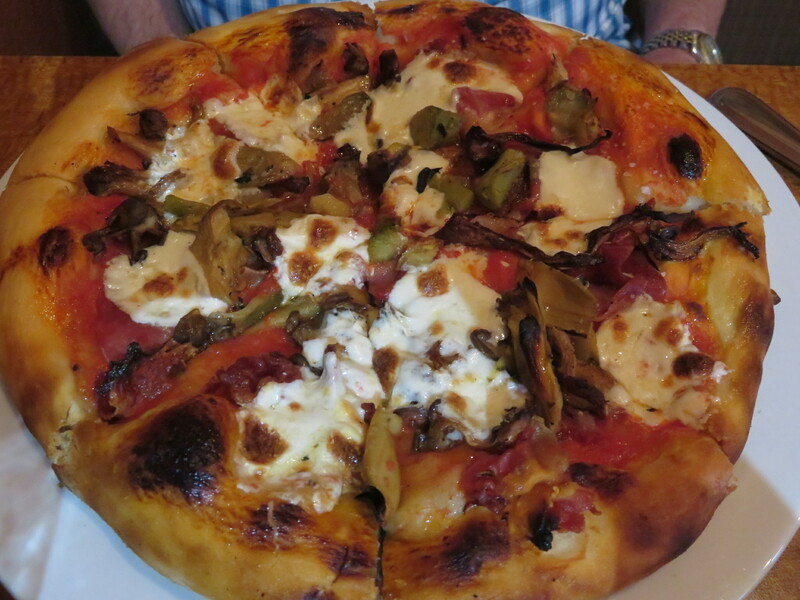 Ric’s choice, an amazing pizza capricciosa with oil cured artichokes, prosciutto, mushrooms. Last night was the night. With the heavy tourist season upon us, we can no longer count on pizza Fridays or dining-out Saturdays, as has been our tradition. It’s just too damned busy along the coast. So we dine mid-week now. Sorella was busy but not slammed this foggy Wednesday evening. Yes, foggy. Like San Francisco, the Oregon coast can become foggy in a moment as hot valley air collides with cold ocean breezes. But I digress…. We were able to claim a table right away even at 19:00. 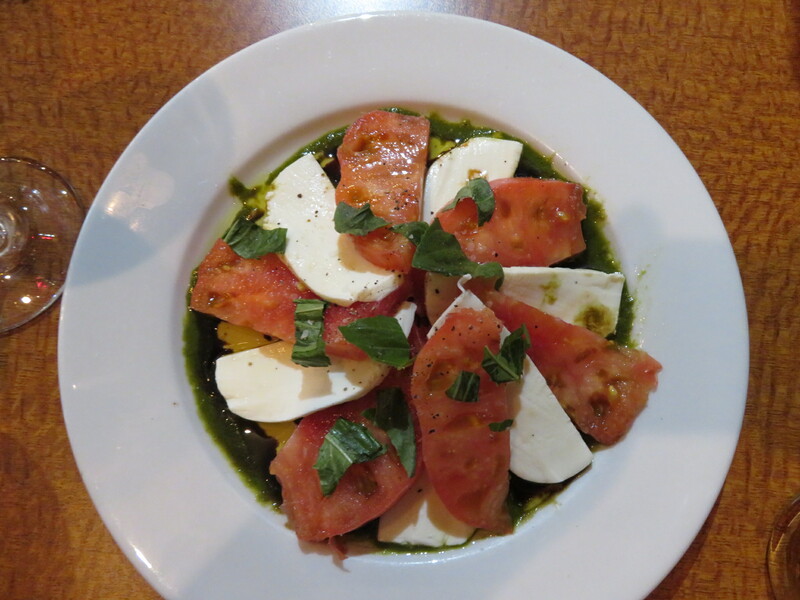 To start, heirloom tomatoes, fresh mozzarella, basil and the usual insalata Caprese condiments. There is a fine list of wines by the glass and excellent local brews on tap. I chose a hard-to-find Nebbiolo while Ric quaffed an IPA. Perusing the menu with every intention of ordering a pasta or secondi, we were once again drawn to the pizza. In a what-the-hell moment, we both ordered pies in order to give them another chance to wow us. I am so glad we did. Local art, Sorella, Nye Beach. Sadly, no polpo on the menu, though. The pizza was not as salty this time. The flavors of the excellent toppings shown through, with even the sweet subtlety of peperonata complementing the flavorful sausage and peppery arugula on my sausage pizza. The crust is flavorful in itself, not merely a conveyance for toppings. This, dear readers, is a major difference in excellent pizza versus run-of-the-mill: do you like the crust on its own? Warm, wood walls, colorful local art. I have to make one criticism: the dinner menu, on second look, did not appeal to us. The pasta preparations just did not strike us as truly Italian. They seemed too complex versus the simplicity we like in Italy. There is cream in the tagliatelle con vongole, for example, and thus I was driven to eat pizza. The antipasto menu is intriguing so perhaps we will return and just dine off that sheet. The sausage pizza is so much more! I love arugula on pizza. More pizzerias need to do it. 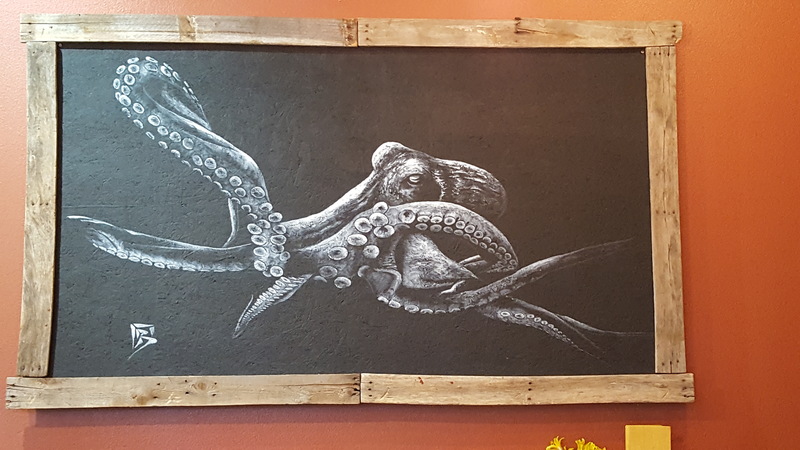 It is a cute restaurant, not-quite cozy but pleasant, with well-spaced tables and fun artwork. The noise level is low, service is efficient and pleasant, and while the pizzas are sized for individual consumption they will happily box the leftovers for you. 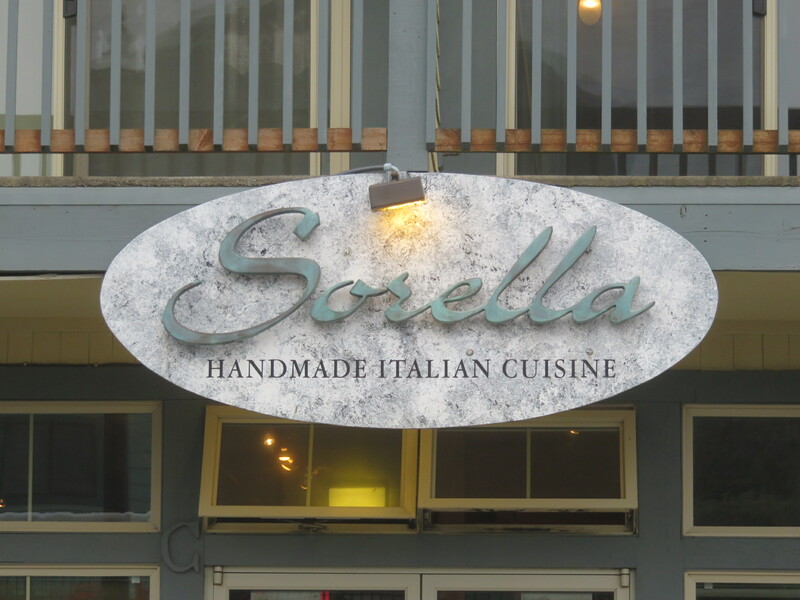 We give an OWP 8 to Sorella, and kudos to them for making The Oregonian’s list of 20 must-visit Oregon coast restaurants! Italian Food: Need I say more?